Home to the PZero line, the Pirelli Corso Venezia flagship store is an homage to the brands industrial past, present, and future. A mutating space, the interior brings to life all the moving parts of Pirelli—from iconic vehicles to a robotic stockroom. Remember Meo Romeo the cat? Yup, even designer Bruno Munari Meo-Romoeo&apos;s famous foam rubber toy is celebrated in the shop (the 1950s comic hero bringing color to the kid&apos;s area). Other key installation points include "The Weather Stairs," which broadcast a succession of climatic conditions corresponding to specific Pirelli race tires. There is also an area dedicated to the made-to-measure P.Spoke sneaker and a comprehensive collection of Pirelli advertisments and past graphic logos. In short, it is an immersive experience dedicated to showcasing the breadth and tradition of a brand rooted in the rich design heritage of home city Milan. 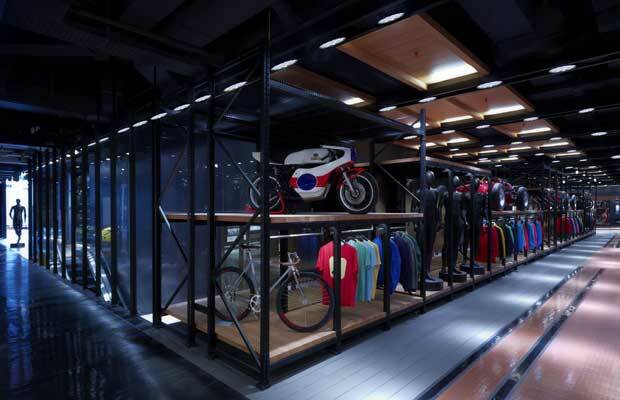 Click the thumbs to tour the Pirelli Corso Venezia flagship store.